The cast of Oh My Grad <老表，畢業喇！> showed up in Central yesterday to promote the show, a comedy serial set in the backdrop of a Hong Kong tertiary education institute. The show—the third installment to the Inbound Troubles <老表> series, stars Roger Kwok (郭晉安), Ada Choi (蔡少芬), and Wong Cho-lam (王祖藍). At the event, the cast passed out curry fish balls while Wong Cho-lam sang to Jinny Ng’s (吳若希) “Love is Not Easy” <越難越愛>, but changed the lyrics to “curry fish balls” instead. 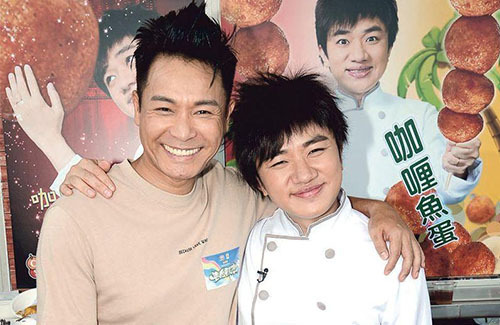 The actor-writer told fans that Oh My Grad has already surpassed 2 million views online, and also thanked Jinny Ng for lending him her song to butcher. After his marriage to Leanne Li (李亞男) in 2015, Wong Cho-lam turned his career focus to Mainland China. Despite finding success there, it wasn’t the most ideal arrangement. Leanne didn’t need to see a doctor, but she did seek counseling. “She’s also gotten a lot more sentimental,” said Cho-lam. Roger shared that is traveling to Prague to film the sequel to The Threshold of an Era <創世紀>. Also starring in the epic drama is Frankie Lam (林文龍), Tavia Yeung (楊怡), Niki Chow (周麗淇), Benjamin Yuen (袁偉豪), Pakho Chau (周柏豪), and Linda Chung (鍾嘉欣). That’s a weak cast for the sequel. All up to Roger. Wong Chi Lam should be in this more. His character in series 1 was so likeable. He needs to appear more and also bring back his mum and dad. Actually they should just make the sequel totally off the first series. We don’t need Ada, Joyce or BabyJohn. so far i do enjoy the show! Barely made it thru the first ep. The jokes were not even funny and that appearance by WCL ‘s character singing that mangled song was pure waste of time and irrelevant and so not funny. I agree. Anyone could have come up with some of lame jokes and especially that dumb song. Not exactly witty humour..